Gold and silver took a sluggish drift higher that was challenged several times without much enthusiasm after the move higher in the overnight, with London and then New York weighing in to the downside, as they are often wont to do. There was a little more 'delivery' action in gold as shown in the report below, but as the warehouses reflect, the bullion is mostly just moved around the plate. What can one say about an exchange that is so heavy and volatile on wagering, but so lacking in actual exchange of real products? The real world action is that gold, and to a lesser extent silver, are moving from West to East. I watched Janet Yellen's testimony to the House today, and it was painful. Deer in headlights all the way. At least the Senators were a little more polite, but Janet Yellen, whatever quality her economic credentials may be, is not a suitable political foil for the verbally acute, mentally and morally light, denizens on the Hill. The exchange she had with Elizabeth Warren yesterday can be seen here. It was clearly not Janet's 'A game.' And Liz Warren was not being particularly tough. She was throwing relative cotton balls with some well thought precision, but was nevertheless knocking Chairperson Yellen for a loop. I think Warren was genuinely surprised at how off kilter Yellen became. I was imagining how the great prevaricator, Chairman Greenspan, would have parried all those questions, turned them on their ears, and rope-a-doped his way through the entire testimony uintil the Congressmen were spinning like tops. Yellen is clearly not in his obfuscatory league. 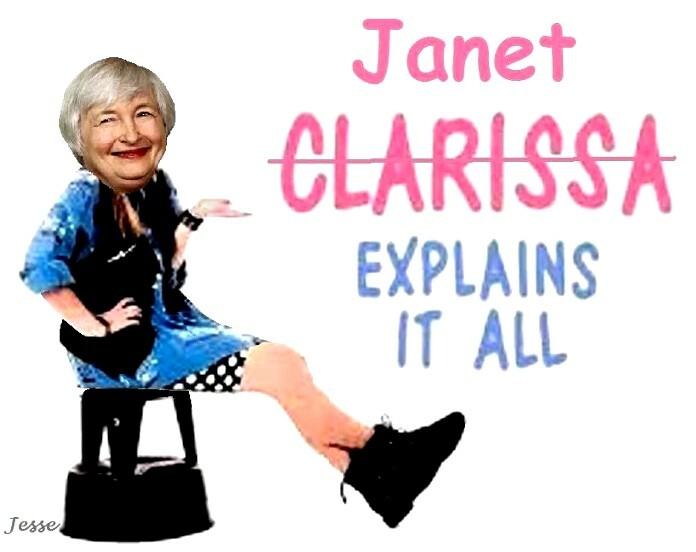 And now we have the hapless but lovable grandmotherly type, just as cute as a button, who valiantly battles on behalf of the Western Bank syndicates, the moneyed interests, and one of the most corrosive forces in Western democracy, the Federal Reserve. The World Wrestling Entertainment (WWE) could not pick and preen their heroes and villains any better. And the action is just about as scripted, and designed to distract from the reality.